Credit: SPL / Photo Researchers, Inc. 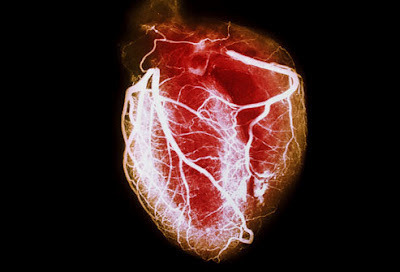 When the heart is not getting enough blood, Acute Coronary Syndrome occurs. It is a heart condition that includes the slowing down of blood flow to the heart because of a blood clot (unstable angina). This can cause a heart attack. A blood clot is an obstruction in the blood vessel that supplies blood to the heart and brain. These blood clots aside from causing a heart attack, can also cause a stroke. A stroke is a brain condition where it doesn’t get enough oxygen because of a blood clot in the blood vessel. Because the brain does not get the oxygen it needs, brain function is impaired and permanent brain damage can occur. This is called an ischemic stroke. The first trial to study patients with acute coronary syndrome who do not undergo coronary stenting or bypass surgery found no significant difference between two anti-clotting drugs – prasugrel and clopidogrel – in preventing the first occurrence of death, heart attack or stroke, according to Duke University Medical Center cardiologists. The study also showed no difference in serious bleeding complications. At the same time, the Duke researchers observed an unexpected reduction in heart attack, stroke and death among patients treated with prasurgrel beyond one year of treatment. The researchers say this potential time-dependent benefit requires further exploration. The results were presented by the Duke researchers at the European Society of Cardiology Scientific Sessions in Munich, Germany today, and published online in the New England Journal of Medicine. "If you look at this study as a comparison of two drugs, it doesn't tell the whole story," says E. Magnus Ohman, M.D., a professor of medicine at Duke and chairman of the TRILOGY ACS study. "This is a unique patient population that has never before been studied." Acute coronary syndrome (ACS) refer to a group of conditions that include heart attacks and chest pain caused by clogged coronary arteries. To date, most trials evaluating anti-clotting drugs for ACS patients have focused on patients who undergo revascularization procedures such as stent implantation with percutaneous coronary intervention and coronary artery bypass surgery to restore blood flow. Up to 60 percent of ACS patients worldwide undergo revascularization procedures according to published data. The remaining 40 percent are managed solely with drug therapy. These patients are at higher risk for repeated cardiovascular-related events, such as heart attack, stroke, and death. "Optimizing medical therapy for these patients is extremely important," Ohman says. Prasugrel and clopidogrel are members of the thienopyridine class of adenosine diphosphate receptor inhibitors that prevent the formation of blood clots in arteries by binding to specific receptors and inhibiting the clumping of platelets. The efficacy and safety of the two drugs were first compared in a Phase III trial called TRITON that evaluated 13,608 ACS patients who planned to undergo stent implantation. The TRITON study, published in 2007, found that 10 mg of prasugrel was 19 percent more effective in preventing cardiovascular death, nonfatal heart attacks and strokes than clopidogrel. It also found prasurgrel caused a higher incidence of fatal bleeding. TRILOGY ACS is a Phase III, double-blind, randomized trial that was developed as a follow-up to the TRITON trial. "We designed our study to see if prasugrel was just as effective in patients who aren't getting coronary stents or coronary bypass surgery," says Ohman. TRILOGY ACS enrolled 9,326 participants at 966 sites in 52 countries. It compared up to 2.5 years of treatment with prasugrel 10 mg daily vs. clopidogrel 75 mg daily, both in combination with aspirin, in ACS patients who were younger than age 75 years. The prasugrel dose was reduced to 5 mg daily for patients weighing less than 60 kilograms. A secondary analysis also looked at patients who were age 75 years or older who received 5 mg of prasurgrel daily vs. clopidogrel 75 mg daily because TRITON demonstrated an increased risk of major bleeding in these patients when they were treated with prasugrel 10mg daily. After a median of 17 months of follow up, the primary end point - described as the time to first occurrence of death, heart attack or stoke - occurred in 13.9 percent of patients under age 75 years vs. 16.0 percent of those treated with clopidogrel. This is considered a non-significant difference. However, a lower risk of recurrent adverse events with prasugrel was observed after 12 months of treatment. "This finding has not been observed in previous studies such as TRITON that evaluated a shorter duration of treatment," said Dr. Ohman. "We believe further exploration of this finding is needed." The researchers did not observe an increase in severe or life-threatening bleeding complications with prasugrel as seen in the TRITON study. "Because we modified the prasugrel dose for patients with a higher risk of bleeding, we observed that prasugrel is as safe as clopidogrel with long-term treatment," said Dr. Ohman.